"STAY LOW - do not stand up or walk in your canoe when you are away from shore. ALWAYS BRING ALONG EXTRA CLOTHING IN A WATERPROOF CONTAINER- you want to be prepared in case your canoe tips or the weather changes." "DO NOT CANOE IN BAD WEATHER." "STAY AWAY FROM LOW HANGING TREES AND BRANCHES NEAR THE SHORE." Be observant for rocks or other obstructions in the path. "Avoiding sunburn can be accomplished in a number of ways. In some situations, clothing can provide the majority of sun protection. When sun exposure is unavoidable, a high SPF sunblock is important. Most experts recommend that sunblock be applied in advance of sun exposure." ​"TIE ALL YOUR EQUIPMENT TO THE CANOE - put your equipment into a waterproof bag to keep it dry and tie it to one of the center beams in the canoe so that you don't lose everything if your canoe tips over." The body of the canoe is the hull. The front end is called the bow, and the back end is called the stern. Each end is covered with a triangular reinforcement called a deck plate. Ropes attached to the bow and stern are called painters. Amidships is the midsection of the canoe. The length of a canoe spans from the tip of the bow to the tip of the stern, and the width of the canoe at amidships is its beam. The length of the hull that comes in contact with the water is the waterline. Gunwales (pronounced “gunnels”) are rails that run along the top edge of both sides of the canoe. Gunwales add strength to the hull and help it keep its shape. Braces, called thwarts (pronounced “ thorts ”), span the width of the canoe and provide rigidity and support. Some canoes also have a keel, a ridge that runs the length of the bottom of the canoe along its center line. A keel improves a canoe’s ability to travel in a straight line but hinders its ability to turn. A portage yoke allows you to carry a canoe upside down on your shoulders. It can be built into the canoe and serve as an additional thwart, or it can be detachable. " "A PFD should be snug and fit like a glove, yet allow you to move freely and not chafe while paddling and playing." "A personal flotation device—also known as a PFD, life jacket or life vest—gives you more buoyancy to help stay afloat. The most important advice about PFDs is simply this: Be sure to wear one. Most states require boaters to have a PFD that is U.S. Coast Guard approved, the proper size for the wearer, in good condition and readily accessible. Laws vary by state, but the USCG recommends anyone operating a human-powered watercraft wear a PFD while in a vessel." "Sizing: For adults, your chest size—not your weight—will determine what size is right. (For children, their weight will determine the size.) "
"Fitting: Once you've selected a size, follow these fitting steps. -Loosen all the straps, put the PFD on and zip it up. -Start at the waist and tighten all the straps. If it has shoulder straps, tighten them last. It should feel snug but not uncomfortable. -Next, have someone pull up on the PFD shoulders. If it moves up past your nose or head, tighten the straps. If it still moves up, the PFD is too large. -Check your movements to make sure it is comfortable and will not chafe you while paddling. Do this in your own kayak or canoe at home, or in a floor model if at an REI store. This will stimulate how it feels while sitting. -If possible, test your PFD in a pool or shallow water to see how it works. It should not ride up or slip over your chin while floating.​"
"Flip your canoe over and drain any accumulated water when you are finished canoeing. Store it indoors if possible, out of direct sunlight, at least two feet off the ground. If you can, store it upside down, with the gunwales resting on sawhorses spaced six feet apart. Periodically clean the canoe to remove dirt and foreign material. Check bolts or screws annually and tighten as needed. Apply marine‐grade oil to wood surfaces." "PFD Care and Maintenance Proper care and storage of PFDs is essential. Allow your PFD to drip dry, and store it in a well-ventilated place away from direct sunlight. Sunlight causes the fabric to fade and the flotation material to weaken. Never use a PFD as a kneeling pad or seat cushion in a canoe, and never cut or alter your PFD. This includes gluing or sewing patches on the fabric that covers the flotation material. Finally, do not repair tears or holes in the material. If the fabric is ripped or if buckles are missing, replace the PFD. Store canoes out of the water and upside down in a covered area away from direct sunlight and extreme heat or cold. Do not store canoes with wooden gunwales on the ground. To prevent damage, do not drag a canoe across the ground or run it up onto the shore or into trees or rocks. Make sure to wipe sand, mud, and other debris out of the canoe after each trip, and make repairs as needed. Oil wooden gunwales, seats, and thwarts of a canoe at least twice a year. The tip of a paddle is easy to damage. To prevent damage to the tip, never rest the paddle on its tip on the ground or use the tip to push away from the shore or rocks. Also, avoid throwing paddles into a vehicle or trailer. When not in use, hang paddles away from direct sunlight and extreme heat or cold. Make sure they have been wiped clean." List of gear suggestions: "Tent & groundcloth Flashlight Extra batteries Ziplock bags Garbage bags Small shovel Cooler Sleeping bag & pad Pillow Maps Backpack First aid kit Toiletries Small stove Multitool Matches or lighter Firestarter Dry bags Dry boxes Small folding chair Extra clothes Compass Water purifier Rope Duct tape Lantern / headlamp Daypack Cooking gear"
"Watertight or waterproof containers keep food, sleeping bags, and other items dry. Dry bags are extremely durable. They are made from a heavy plastic and generally have a roll-up watertight closure and shoulder straps and hip belts for portaging. A Duluth pack is made from water-resistant fabric but does not have the watertight seal of a dry bag. Other good waterproof containers include 5-gallon resealable buckets and waterproof map cases. Simple plastic bags such as resealable freezer bags and heavy-duty garbage bags work well, too. When using garbage bags, double-bag all items and close the bags with a thick rubber band. Then place the garbage bags in a duffel bag, stuff sack, or other container to protect the bag from being punctured or torn." "How much a canoe can hold is based on its length, height, and width. The U.S. Coast Guard measures capacity by loading a boat until it has 6 inches of freeboard—the distance between the water surface and the gunwales. A canoe should never be loaded so heavy that less than 6 inches of freeboard remains or loaded beyond the manufacturer’s suggested weight limit. If a canoe is balanced in the water from end to end and side to side, it is said to be trim. If your canoe is not trim, it will be unstable and difficult to maneuver. A good way to judge the trim of your canoe is to take a step back and look at the loaded canoe from the front and side. Make adjustments as necessary to ensure that your canoe is trim." 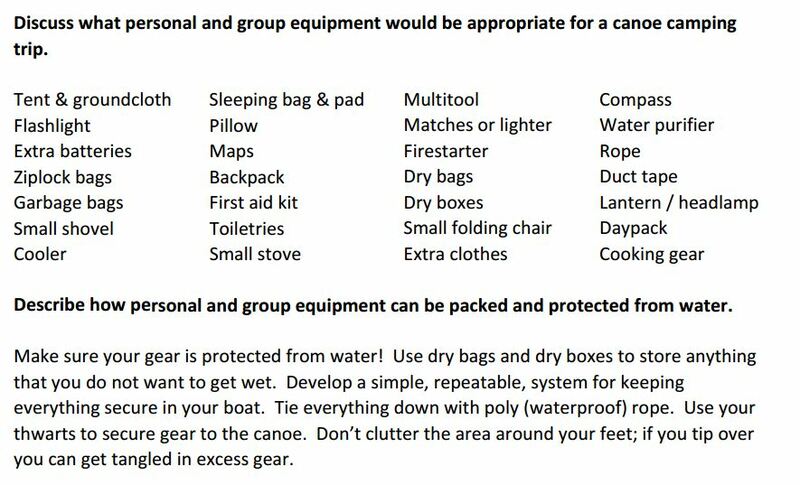 "When packing your canoe, place everything that must stay dry in a waterproof container. Secure all items to the canoe so that nothing will fall out. Try to fit dry bags or Duluth packs under the thwarts and clip the straps to them. Use cam straps, bungee cords, and pieces of rope to secure items. Secure your equipment so that if the canoe were to capsize the equipment would not fall out past the gunwales." 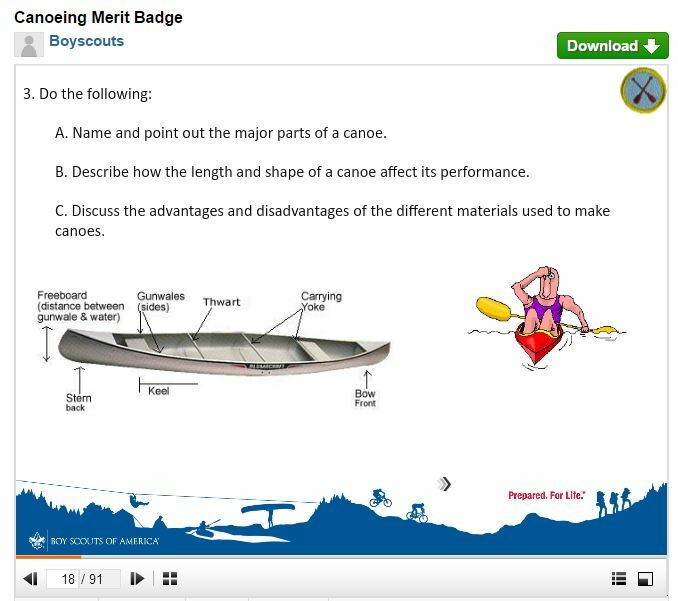 How to flip a canoe (for b): https://www.youtube.com/embed/VUI_OEwRQoo?rel=0 taken from Northern Tier videos.